Now for the long answer, let me try through 2 sample code snippets. Here we have the main function which has 2 console.log commands logging ‘A’ and ‘C’ to the console. Sandwiched between them is a setTimeout call which logs ‘B’ to the console with 0ms wait time. The call to the main function is first pushed into the stack (as a frame). Then the browser pushes the first statement in the main function into the stack which is console.log(‘A’). This statement is executed and upon completion that frame is popped out. Alphabet A is displayed in the console. The next statement (setTimeout() with callback exec() and 0ms wait time) is pushed into the call stack and execution starts. setTimeout function uses a Browser API to delay a callback to the provided function. The frame (with setTimeout) is then popped out once the handover to browser is complete (for the timer). console.log(‘C’) is pushed to the stack while the timer runs in the browser for the callback to the exec() function. In this particular case, as the delay provided was 0ms, the callback will be added to the message queue as soon as the browser receives it (ideally). After the execution of the last statement in the main function, the main() frame is popped out of the call stack, thereby making it empty. For the browser to push any message from the queue to the call stack, the call stack has to be empty first. That is why even though the delay provided in the setTimeout() was 0 seconds, the callback to exec() has to wait till the execution of all the frames in the call stack is complete. So the delay parameter in setTimeout(function, delayTime) does not stand for the precise time delay after which the function is executed. It stands for the minimum wait time after which at some point in time the function will be executed. 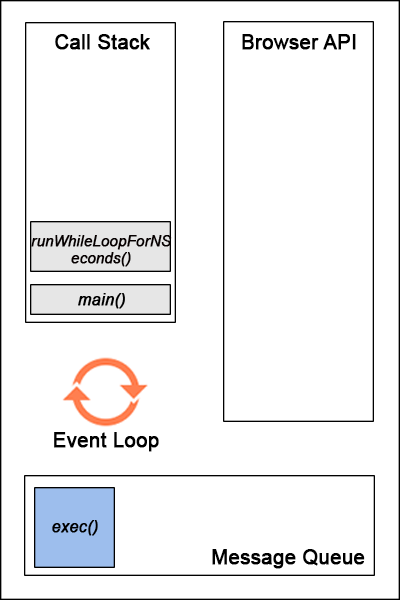 The function runWhileLoopForNSeconds() does exactly what its name stands for. It constantly checks if the elapsed time from the time it was invoked is equal to the number of seconds provided as the argument to the function. 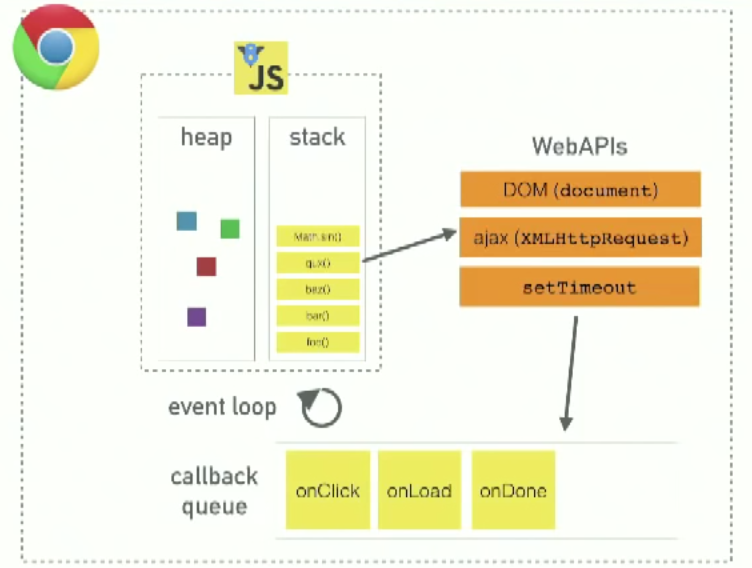 The main point to remember is that while loop (like many others) is a blocking statement meaning its execution happens on the call stack and does not use the browser APIs. So it blocks all succeeding statements until it finishes execution. So in the above code, even though setTimeout has a delay of 0s and the while loop runs for 3s, the exec() call back is stuck in the message queue. The while loop keeps on running on the call stack (single thread) until 3s has elapsed. And after the call stack becomes empty the callback exec() is moved to the call stack and executed. So the delay argument in setTimeout() does not guarantee the start of execution after timer finishes the delay. It serves as a minimum time for the delay part.